Promising news in the campaign against female genital mutilation: 10 villages in Niger have publicly denounced the practice and the parliament in Iraq's northern autonomous region of Kurdistan is preparing to issue a ban. Village leaders have called for all people living in the Tillabery region of Niger to end the practice, reports CNN. "We have decided to definitively put an end to female genital mutilation in our villages and to continue sensitizing neighboring villages so they also give up the practice," said N. Babobou Pana, leader of one of the villages. According to UNICEF, the rate of FGM among women ages 15 to 49 in Niger has decreased by half, from 5 per cent in 1998 to 2.2 per cent in 2006. However the statistics conceal how prevalent the practice is in certain regions and ethnic groups, where the rate may be higher than 65 percent. The Tillabery region has one of the highest rates of FGM. Between 100 to 140 million girls and women across the world have undergone FGM, according to World Health Organization statistics. It is most widely practiced in Africa, where about 92 million girls above the age of 10 have been mutilated. 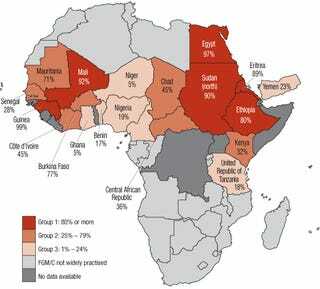 28 countries in Africa perform FGM, and as shown in the graphic below from the World Health Organization, rates vary widely by region. While FGM is most prevalent in Africa, it is also widely practiced in some regions of Asia and the Middle East. WADI, a German nongovernmental group that advocates against female circumcision, has been studying the problem in Iraqi Kurdistan since 2004 and found that more than 60 percent of women in the region underwent the procedure, according to the group Stop FGM in Kurdistan. However, in some areas the rate is as high as nearly 100 percent. A bill banning FGM was submitted to Kurdistan's Regional Parliament in April 2007 and according to a female MP and a doctor who have been campaigning against the practice, it is expected to pass soon. But many women are still being mutilated. One of the latest victims is Iraqi Kurdish four-year-old Shwen, who is pictured above screaming during her circumcision in Suleimaniyah earlier this week.